Grow indoors or out Hardy in zones 5-9, or indoors Prefers the sun or part sun Grows 10 feet tall or trim at any height The plant you will receive is growing in a 4" pot and about 8" tall. It has many stems. A newly discovered bamboo with new culms (stems) that have attractive rusty reddish sheaths and a non-invasive root system. 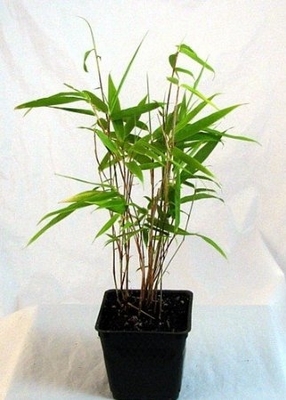 This introduction is proving to be one of the most hardy and versatile clumping bamboo in the landscape. It is a shorter bamboo, only about 10 feet tall when mature, but a vigorous grower, sending up many new clums each season. The new clums of this bamboo leaf out early in the summer, making it an excellent choice where its rapid growth is desired.